[imp Australia] 1989 grey stallion, pure Crabbet. 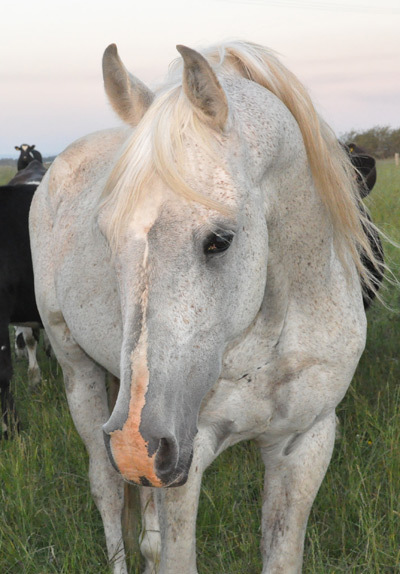 Silver Omen is now 29 and his oldest New Zealand progeny were born in 2007. Omen’s superb and tractable temperament has been passed on to all his foals, and we are thrilled with what he has left for us. His foals have all proven easy to start and are good rides. Several have reached open endurance status. When Omen was with his previous owners in Australia he did some endurance with success we’re told. His previous owners also had some well put together young stock by him. Since being at Aurora he has been our main sire. Omen has nine crosses through his sire line to the great Polish bred stallion Skowronek and three through his dam line. When it comes to the great war mare Rodania, Omen has 12 crosses through his damline and eight through his sire line. This must be the reason he is so athletic. Omen is available to a select number of mares this season.